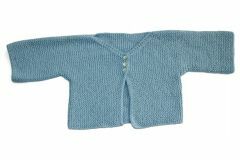 Simple but very clever baby jacket with finished sizes 40(50,60) cm around. Can you work out how it is made? Length of spare yarn in different colour but same thickness.